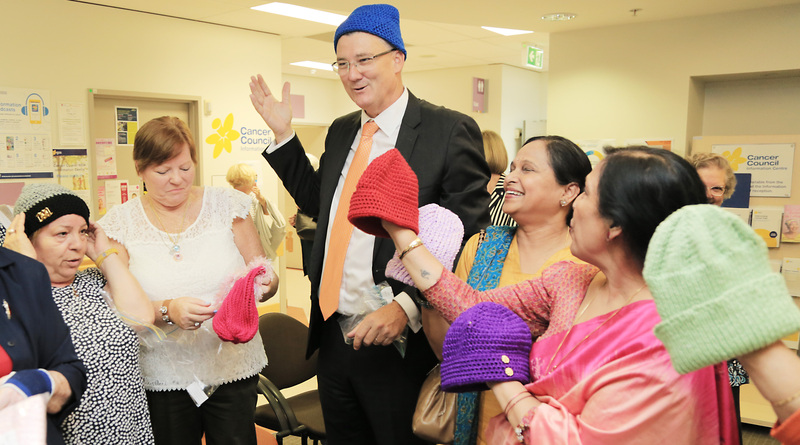 Hundreds of handmade beanies have been given to cancer patients at Westmead Hospital. More than 500 handmade beanies have been donated to cancer patients at Westmead Hospital. A knitting group from Western Sydney has put smiles on the faces of cancer patients at Westmead Hospital through a donation of lovingly crafted beanies. The ladies recently presented more than 500 handmade beanies to the Crown Princess Mary Cancer Centre. Radiation and Oncology Nursing Unit Manager, Noeline Rozanc said the beanies go to adults and children undergoing chemotherapy and radiation therapy. “We often have boxes of beanies available on our reception desk for our patients that don’t have hair or for some of our other patients that are having treatment and have significant dressings on their head,” Noeline said. “Being able to cover that up with a beanie makes a big difference to them”. The beanies are the work of a group of ladies from Karabi Community and Development Services, based in Western Sydney. Karabi Acting CEO, Julie Bosley said the group successfully applied for a Seniors Week grant worth $500. The group used the money to buy wool with the aim of making 200 beanies, much more than their regular monthly delivery. “They’ve all got their little bit of bling on them, so they’ve got that personal touch in them as well, they’re gorgeous,” Julie said. In an incredible feat of knitting, the ladies managed to produce more than 500 beanies, which they personally delivered to the cancer centre. “We always feel a sense of pride when we know our local community are out there doing things that help us look after our patients,” Noeline said. “Their whole life has been turned upside down, to feel someone out there cares, while they are going through that, gives that little bit of extra comfort and strength,” Julie said. Mark Taylor, the Member for Seven Hills, helped the knitting group secure its grant. “Wool, obviously, if they buy it themselves is quite expensive, they go through a lot of beanies, so we helped them out with a grant a few months ago,” he said. “They asked, why don’t you come down and see us deliver them and it’s an absolutely fantastic day to see,” he said.